Throughout history, communication technologies have had a profound influence on the manner in which people perceive their world. Likewise, evolutions in communication technologies have often led to revolutions in societies. The invention of the printing press, for example, had a considerable contribution to the formation of modern nation states as groups of people dispersed across large territories suddenly had an important thing in common- their language. The printing press was also the main vehicle of the protestant reformation that swept through Europe in the 16th century changing it forever. During the 19th century, it was the Telegraph that sparked the imagination of the world. People truly marveled at this new technology that could transmit information from a remote village in India to the heart of London in a matter of seconds. To the Victorians, the world had never seemed smaller, flatter and more manageable as there was no longer meaning to time and space. Their world was now compressed. This was the age of the Victorian’s empire, and Britannia ruled the cables as well as the waves. The age of the Telegraph also saw rapid advancements in scientific research of human physiology. This led to the Telegraph being compared to the human nervous system. The brain of the empire, London, could send and receive information from its sensors, the colonies, by means of electricity. Even our personal lives are now imagined as networks in which nodes represent our friends to which we transmit information and from which we receive information. The conceptualization of our life as a network has also been facilitated by the rise of social networking sites such as Facebook and twitter. While the nervous system and network models appear to be exclusive, it is my contention that both are relevant to the 21st century and specifically to diplomacy in this century. I therefore propose in this post that Ministries of Foreign Affairs (MFAs) who have begun to practice digital diplomacy could benefit from imagining their online activity as both a global information network and the human nervous system. 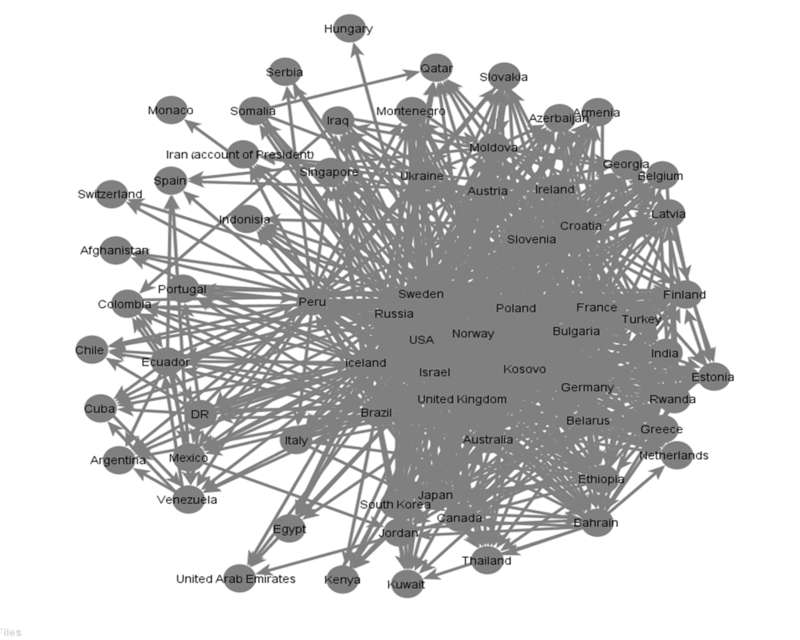 As I have often demonstrated on this blog, digital diplomacy can be analyzed using network analysis. This is due to the fact that MFAs now routinely follow one another on social media (e.g., twitter). Following a foreign MFA enables one to gather important information such as other nations’ foreign policy initiatives and goals. Likewise, MFAs following their peers on twitter are able to anticipate shifts in policy and even analyze relationships that exist between countries. For instance, by evaluating the manner in which the US is portrayed on Iran’s twitter channels, MFAs may be able to assess the degree to which Iran is willing to re-join the League of Nations and abandon its nuclear ambitions. If the US is portrayed as a foe, then Iran may be stalling for time. If, on the other hand, the US is presented as an influential world leader, then Iran may be in the midst of an historic pragmatic shift in policy. Like MFAs, bi-lateral and multi-lateral embassies now also follow one another on social media. For example, the majority of embassies to the UN headquarters in New York are linked to one another thereby constituting an information network. Of course, embassies and MFAs use such networks to not only gather information but also to disseminate information to their online peers. With one tweet, nations can communicate foreign policy agendas to the entire diplomatic milieu. 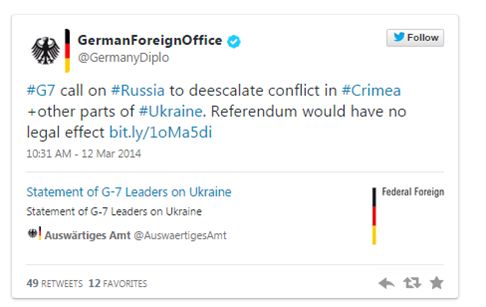 Such was the case with the following tweet published by Germany’s MFA during the 2013 Crimean Crisis. This 140 character tweet informed the global diplomatic community that the G-8 group was now the G-7 group as Russia was to be isolated from the international community following its incursion into Ukraine. This tweet also demonstrated that the G-7 nations had decided to react in unison to Russian aggression. Thus, an entire foreign policy agenda was transmitted to the global community with the click of a button. 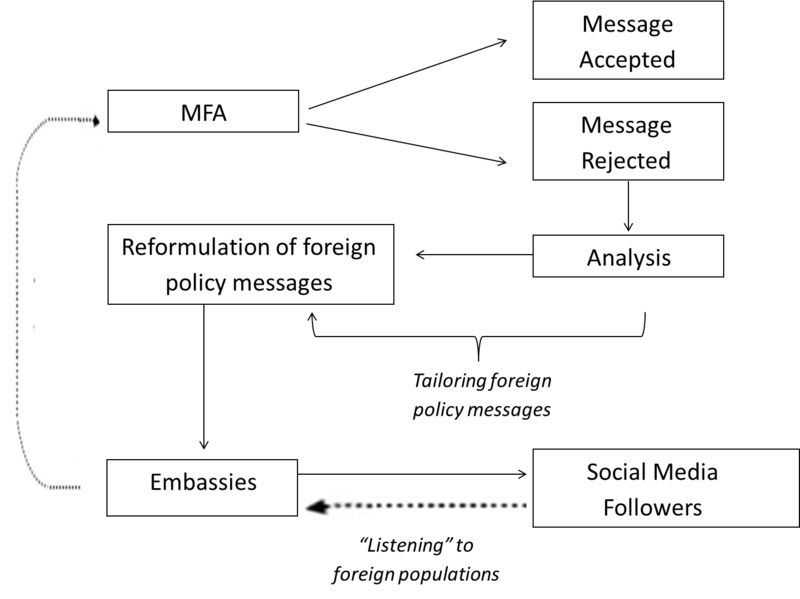 By imagining MFA and embassy level digital diplomacy as information networks, MFAs can utilize social media in order gather and disseminate information on a global scale. Such a conceptualization might encourage MFAs to invest resources towards increasing their ability to condense foreign policy messages into 140 characters and to analyze the underscored meanings of tweets posted by their peers. This process, which we may refer to as digital diplomacy literacy, demonstrates MFAs’ need to develop new professional skills in order to contend the advent of digital diplomacy. Yet the network model should be applied by MFAs and embassies when working opposite their foreign peers. The interaction between an MFA and its many embassies abroad, on the other hand, could be imagined as a nervous system. In this model, MFAs could regard themselves as the brain. Indeed it is the MFA that serves as the command and control center that gathers and disseminates information from its sensors- the embassies. Using the nervous system model for internal digital diplomacy would allow MFAs to make full use of the feedback they receive from their online followers with regard to foreign policy messages, goals and agendas. Foreign policy messages that are formulated at the ministry level are disseminated to foreign populations through social media accounts at the embassy level. Yet digital diplomacy cannot be viewed as a one way communication process. On the contrary, as the medium of digital diplomacy is social media it must be understood as a two way communication process. Embassies can now use social media feedback in order to analyze the degree to which their foreign policy messages are accepted or rejected by their followers. This information should, in turn, be transmitted to the brain (the MFA) who can then assess whether there is a need to redefine foreign policy goals. It is in this manner that the embassy is transformed into a sensor that continuously provides the MFA with feedback from foreign populations. An interesting example that could demonstrates the nervous system model is a tweet published by the US First Lady, Michele Obama, in May of 2014. 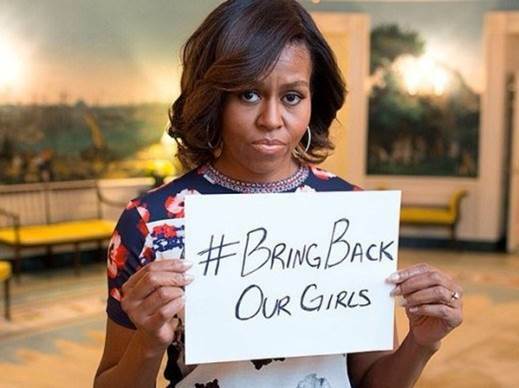 Obama uploaded a selfie to her twitter channel in which she held a sign with the hashtag “bringbackourgilrs” referencing the kidnapping of Nigerian schoolgirls by Boko Haram. This tweet sparked a counter social media campaign in which people throughout the world uploaded Selfies with a sign reading “#bringbackyourdrones” referencing the use of drones by the US in its war on terror. In the nervous system model, such counter campaigns would be promptly relayed back to the brain by the sensors. The MFA could then attempt to analyze in which nations Obama’s message was rejected, and why. Was it rejected by European social media users who view the US’s use of drones as unethical? Or was it rejected by social media users in the Middle East who view the war on terror as Anti-Muslim? Moreover, the brain could analyze how the rejection of Obama’s message relates to the manner in which the US is viewed by different nations across the world. For example, the State Department may infer that America is still viewed as Anti-Muslim across the Middle East. It could then attempt to re-shape its image amongst such populations through nation branding campaigns tailored to specific populations and delivered through embassy social media accounts. Finally, as the MFA is part of the government, it could use social media feedback in order to recommend changes to existing foreign policy agendas. Thus, the MFA becomes a sensor for a new brain, the administration, which is in charge of the nation’s foreign policy. 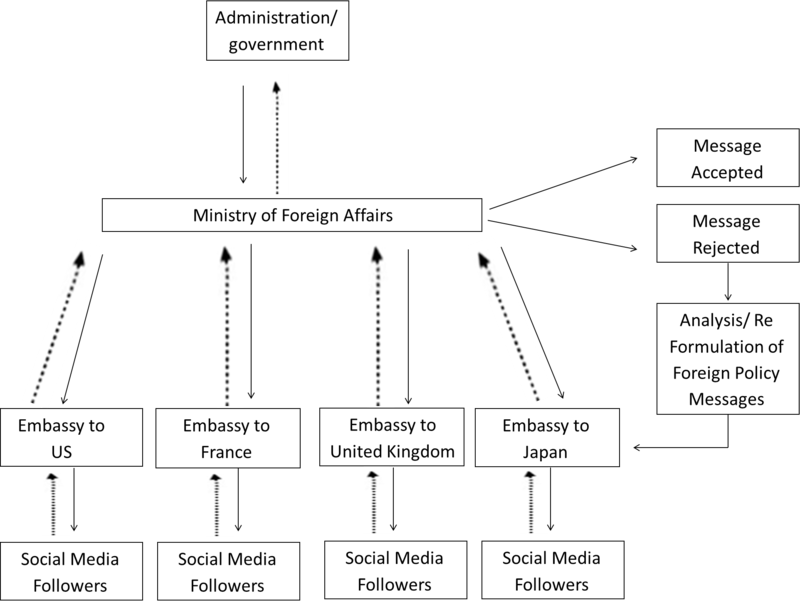 By adopting the nervous system model in order to conceptualize the MFA’s work opposite its embassies around the world, ministries may be able to make full use of the social media evolution. And there is evidence that is already taking place. A foreign diplomat recently told me that his nation’s embassies from around the world now incorporate social media discourse when reporting back to the MFA. Social media discourse is therefore used by embassies in order to provide the MFA with information regarding the acceptance or rejection of foreign policy messages. These reports are transmitted to the MFA through diplomatic cables. And so it seems that the telegraph’s technology is being used to transmit tweets thus demonstrating a link between the network model and nervous system model of digital diplomacy. Posted in Uncategorized and tagged communication, communication models, Digital Diplomacy, Michele Obama, social networks, Telegraph, Twitter. Bookmark the permalink.